Depending on who you listen to, FX has both the best comedy in the entire world in Louie, and the best drama in the entire world in Justified. Since I'm more of a drama guy, I decided to make the latter one of my summer catch-up shows to see if it could live up to the hype. The final verdict: kinda. Cop procedurals are a dime of dozen, and it seems like every branch of law enforcement has its own version, so it's not a surprise that the U.S. Marshals got their due diligence with Justified. 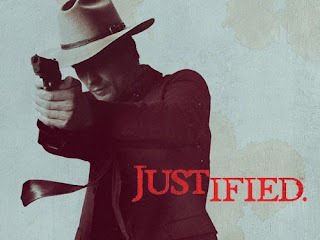 Now, I like a good cop show from time to time, and I'm a sucker for Elmore Leonard, but for some reason Justified didn't jump out at me when it first aired. I think it had more to do with my indifference towards FX as a brand than the show itself, but then Terriers came out, and I started to pay attention to the cable network. While I ultimately didn't care for that show, I did start to become interested in its other shows like Sons of Anarchy which of course led to Justified. Now, I'll admit that I didn't love Justified at the beginning. Season 1 started off like every other police procedural with a Case-of-the-Week structure, and unfortunately most of the cases were not all that interesting. Then things started to turn as the show started to focus more on Rylan Givens, and that's when I started to care. Sure, focusing on a lawman's family and personal lives isn't anything new, but these relationships gave Rylan some depth, and the show started to make more sense. Season 2 amped up the interpersonal drama between Givens and those around him, but it also made Kentucky a character unto itself, and I that's when I understood where the hype was coming from. As a procedural, Justified is above average at best, but it excels as a character study. I found myself caring less about the criminals Rylan was chasing and more about criminals that surrounded his life because they added a color to the series that I've never quite seen before. The uniqueness of the characters and the world has drawn me in, and while I cannot say that Justified is the best drama on TV, I will say that it is well-crafted and worth checking out.